Open the tab “Available resources”. There is the list of your existing resources, you may add, edit, and delete them. Each resource uses a SharePoint list as data source. 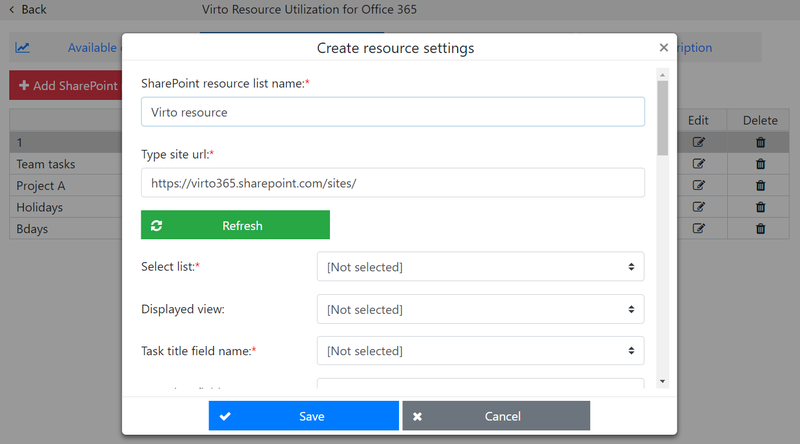 Click “Add SharePoint resource list” to add a new resource. Type a resource name in the new pop-up window. Then select a site URL which contain a data source SharePoint list you want to add as resource. You may also type another route to a subsite where the source list is located, click “Refresh”, and select a SharePoint list. Select a list in the dropdown. Define a default view that will be used when you open this resource in the chart. 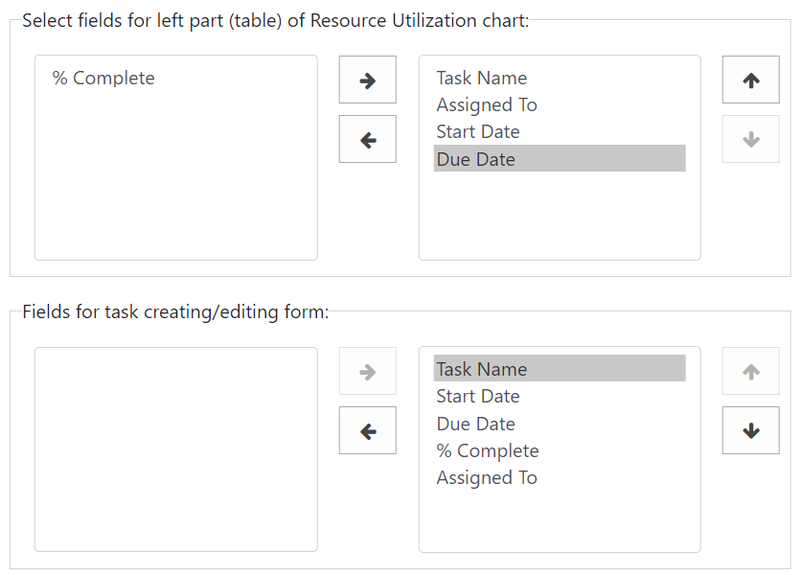 Then you need to match fields for chart with resource list fields. 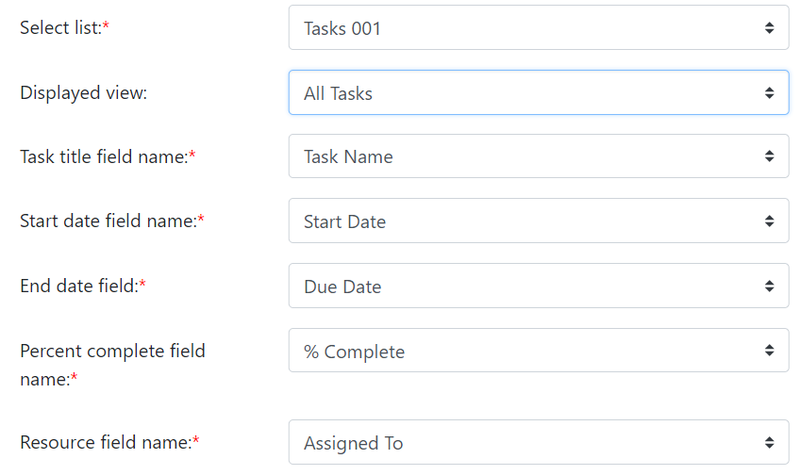 The following fields are required: “Task title”, “Start Date”, “End Date”, “Percent complete”, and “Resource”. Task name can be a field of following types: “Text”, “LookupMulti”, “Lookup”. Start Date and Due Date fields are fields of DateTime type. Percent complete is a number field. All fields must not be ReadOnly fields. The following field types not available for selection in current version of Virto Resource Manager: “RelatedItems”, “ModStat”, “Attachments”, “OutcomeChoice”. Any column can be selected as a source column for resources. Then you can define colors for this resource in chart. 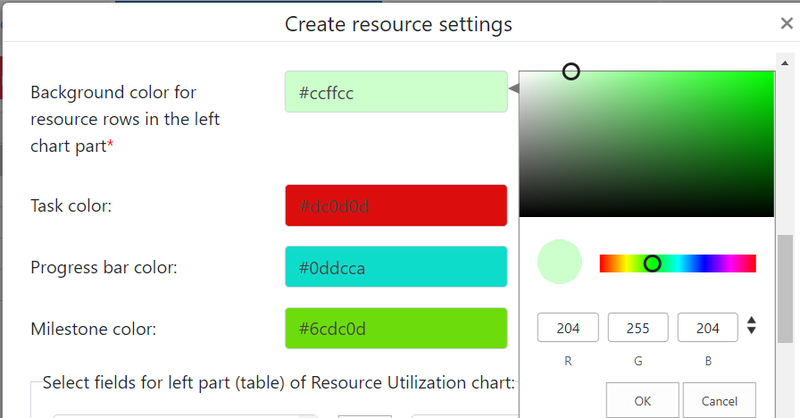 For example, the color scheme above was applied to the resource in a chart. Now, select fields to be displayed in the left part of chart, on the task edit/create form and in the task tooltip. The fields order will be displayed according to the order selected there. Click Save to add a new resource. The new resource will be displayed in the end of resources list.